Announcing something that is not only exciting but unique within our community. I have teamed up with fellow well know exchange traders, Caan Berry and Mark Iverson, to offer you the opportunity to attend this groundbreaking event. This isn’t a conference; it’s so much more. We are delighted to tell you that the event will be sponsored by Betfair. This is what we have planned. The venue will be the Village Hotel, Coventry. On Saturday 16th February 2019. Starting at 12:30pm and running through until the lads cannot drink anymore and are removed forcibly from the bar. You can arrive from 12:30 pm for registration, grab a coffee and take your seat. At 1:00pm we will kick off proceedings and introduce everyone. 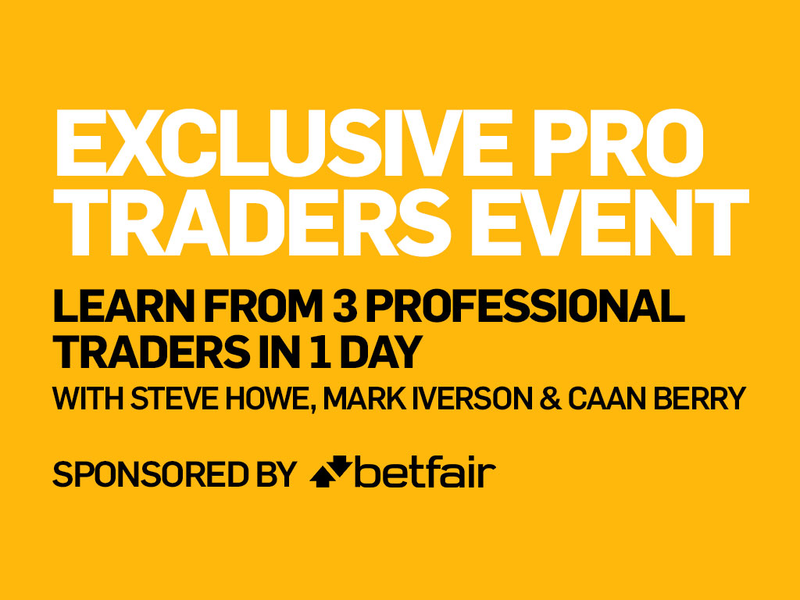 There will be 1-hour presentations made by Caan, Mark and Steve where we give you some real strategies and tips about how to use them to make a few quid. Let us make something clear. This isn’t an hour of waffle. It’s sound, practical advice from people who know what they are talking about. In between, there will be breaks to let you get a drink, Bacon Buttie (all included in price) or a quick cigarette/loo break. The last part of our presentations will be a Q & A session where the guys will answer your questions. There is no real time limit on this, so make sure you have a question planned. Our answers will be straightforward and honest. At the end of the presentations, we will break for some food. We have spared hardly any expense, and have a nice little hot/ cold buffet for you. After all this talking, we will be thirsty. So we invite you all to join us in our private bar, where we will let you buy us as many beers as you can afford. This is a great opportunity for you to meet people just like you. Traders. We all have this shared passion, but it’s hard to find people who understand what you’re talking about. Networking with others is a great way to exchange knowledge and form new friendships. The guys will be available to chat with all evening. So if you come, there is no excuse not to be able to ask those burning questions. 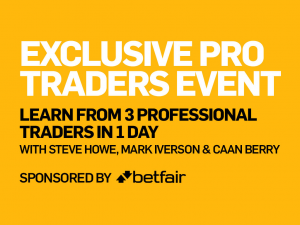 Betfair representatives will also be in attendance, they love to meet their customers and get their feedback too. I’m pretty sure that Betfair will be sending you away with a gift too. Make no mistake; this will be a hot ticket. Tickets are limited and will sell faster than if Led Zeppelin announced a reunion concert. We hope you can come, and look forward to meeting you. You will be our guests, you will be treated as such. We will look after you and ensure you have a great time. We are all friendly and approachable guys and look forward to meeting and chatting with all who can come. There are a limited amount of tickets we can provide. We wanted to make this event as affordable as possible. So we can offer tickets at £150. This is going to be awesome, can’t wait. This entry was posted in Uncategorized by MG. Bookmark the permalink. I have no idea what “this shite” is Hector. I cannot believe you have read through what is on offer and if you have you must be confused as to what we are doing. so let me take the time and trouble to explain. This event has taken lots of planning, I don’t know if you have ever organised anything of this scale, but trust me it doesn’t just happen. We are all speaking for at least an hour each. I don’t know exactly what Caan and Mark are speaking about in any detail. But my hour will be practical ways to make money. if applied correctly (and they are easy to apply) they should cover all costs to anyone that comes. We will also do an hour-long Q&A, nothing is off the table, we will not be evasive or vague. We genuinely want people to have a great experience and have great value for money. We are providing all beverages inc cans of pop and coffee/tea and 2 meal breaks. not some crappy old sandwich, but proper catering of a high standard. That isn’t free to us, nor is hiring a hotel venue conference suite for 12 hours. my time is not free either, is yours? My knowledge is not free either, is yours? Do you have a job? If so, if your boss asked you to work for a couple of days for free, would you? I have no idea what line of work you are in, but if you have a skill I am guessing your salary reflects that level of skill. So you are paid for your knowledge and time. After we have finished speaking, we are providing the facility for people to network and mix with likeminded individuals – You don’t have to be a Pro trader to do that, why haven’t you done it? Why hasn’t anyone else done it? Have you been on any of my workshops> No> Thought not, perhaps you are the sort of person that wants everything on a plate, for free? The people that I have educated, in the main part do well. I have trained over 40 people now to be able to be full-time traders. They are successful because they took a leap of faith, invested in their education and put in the hard work and hours needed to succeed. So let me apologise for daring to ask for money to share my time and expertise. It’s ok for every other person in the world to do that. It’s called a job, exchanging time and skill for money. So when you next get in a cab, ask the cabbie to take you for free, next time you get your hair cut, see if the hairdresser will do a freebie. so that’s my reply to you, another 10 minutes of my life wasted. That reply was to Hector (maybe not his real name). This bit is to the rest of you reading this. If you think this will be an informative, fun day where you can learn a bit of new stuff, be entertained and have some quality social time and make some new friends who “get” what you do. Please come along, we will be very happy to see you (But understand I may profit from this – sorry about that). If it’s not for you, I wish you well. If you are one of these sad haters…. I really don’t care what you think. I’m looking forward to it Steve, It can and has been a lonely road learning for nearly 2 years. I’ve never attended any trading event before and am looking forward to it. Just a quick question, will there be much on inplay trading? Not sure what Caan is talking about, but In Paly trading is something I don’t do, so a no from me.